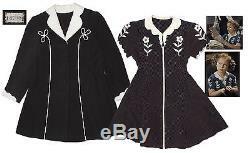 Shirley Temple screen-worn dress and coat from 1938 musical''Just Around the Corner''. Temple stars as Penny, a little girl whose father lost his job. She can be seen wearing the costume during the scene in which she helps her father pack for a trip to Borneo. Dress in brown silk with tiny cream polka dots features short sleeves ending in scalloped edges and cream color trim repeated at the collar. Collar ties closed with a small bow of cream silk concealing a hook and eye closure. Cream silk flowers adorn the top of the dress. Dress has pleats and a tie in the back and zips up the front in contrasting cream zipper. Measures 14'' across the chest and 31'' in total length. Luxurious chocolate brown wool coat bears studio label reading''14705'' sewn into the right shoulder seam. Coat is fully lined and features contrasting cream piping and collar in silk faille, with rear box pleat. Measures 13.5'' x 28.5''. Zipper pull for the dress is absent and some faint staining to coat collar, else near fine. Note that in the colorized version of the movie, the dress color was changed from brown to blue, but the dress is its original brown color. With a COA signed by the Shirley Temple estate. The item "Shirley Temple Worn Dress from Just Around the Corner" is in sale since Thursday, March 10, 2016. This item is in the category "Entertainment Memorabilia\Movie Memorabilia\Wardrobe\Originals". The seller is "n8sautographs" and is located in Los Angeles, California. This item can be shipped worldwide.